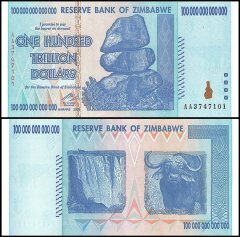 On the obverse of the 100 trillion Zimbabwe Dollar we can see the famous Chiremba Balancing rocks from Epworth, a Harare Province. These rocks are said to represent the delicate balance between man and nature. This banknote also has a hidden a watermark that displays a complete denomination when held up to a light source. The reverse of the banknote features Victoria falls and a cape buffalo. Victoria Falls, or known by the locals as the Smoke that Thunders, was named in honor of Queen Victoria by David Livingstone in the mid-1800’s. The cape buffalo is an African bovine that can reach a length of 10 feet, height of 5 feet and weigh almost a ton! The cape buffalo is infamous for attacking hunters and reports claim that they kill or injure more hunters than any other animal in Africa.